1903 My Grandmother's first faux pas on arrival was to tell the porter who had carried the luggage to their new home that he was welcome to get rid of the tea chests that they had used to pack some of their possessions. The man took her at her word and carried off the lot before they had been unpacked. Maria Luisa, (2.4) beside herself with indignation, marched off to the police and demanded instant action. The officials reminded her of the size of the city of Bombay and told her that there was little they could do about it. It was not the kind of answer that Maria Luisa (2.4) took kindly to. 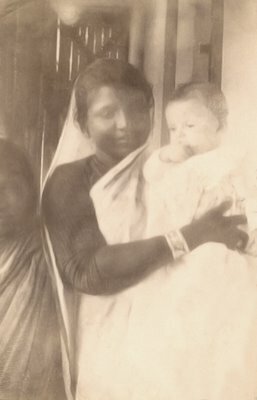 Snapshots of my mother’s young sister Edith and two of her Indian ayahs. 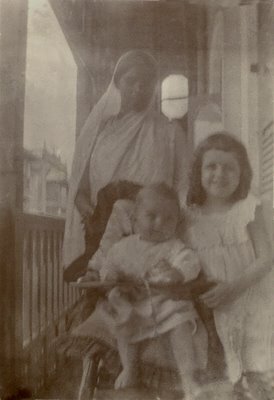 These photos were probably taken in the balcony of the family house at 8 Navasari Chambers, Outram Road, Bombay. Judging from the type of buildings that appear on the opposite side of the road it was probably quite a posh address.These two snapshots are the best ones I have of Edith. I suspect the photos were taken by her father George Letts (2.3) . Two years later both he and his younger daughter would be dead. Maria Luisa’s (2.4) second blunder was to persuade George (2.3) to transfer their savings from a reputable firm to one of the many local banks offering a much higher rate of interest. George was badgered into accepting and shortly afterwards the local bank went bust. She was also immediately at odds with the servants as she failed to understand the Indian Caste system, which in so far as it affected servants in those days, appears to have been an oriental version of Trade Union demarcation lines. But no matter how often George explained it to her she persisted in putting her foot in it. 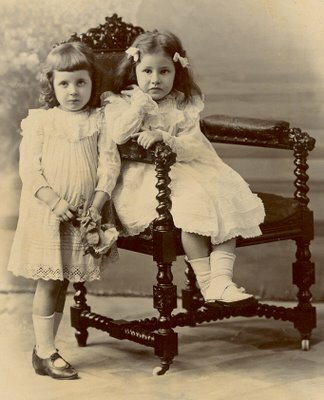 More snapshots of Edith and one of her ayahs this time with her sister Evelyn (1.2). The photos were probably also taken in the balcony of Navasari Chambers. Generally Maria Luisa seems to have been as impetuous and temperamental as George was measured and phlegmatic. It was a curious relationship: tempestuous on the one side, calm and collected on the other. One day what must have been a typical incident occurred while the two of them were having lunch in their house in Bombay. Apparently a heated argument took place between them about some now long forgotten subject. This had come to an abrupt end when Maria Luisa, in a fit of pique, left the table and locked herself in her room, hoping her gesture would spoil her husband's dinner. George, true to character, calmly continued eating as if nothing was amiss while Maria Luisa was left with no dignified option but to remain locked up in her room 'comiéndose de sus carnes' for want of anything else to eat. The fact that the incident was retold with great relish by Maria Luisa herself In later life, shows that whatever her other faults, she did have a sense of humour. 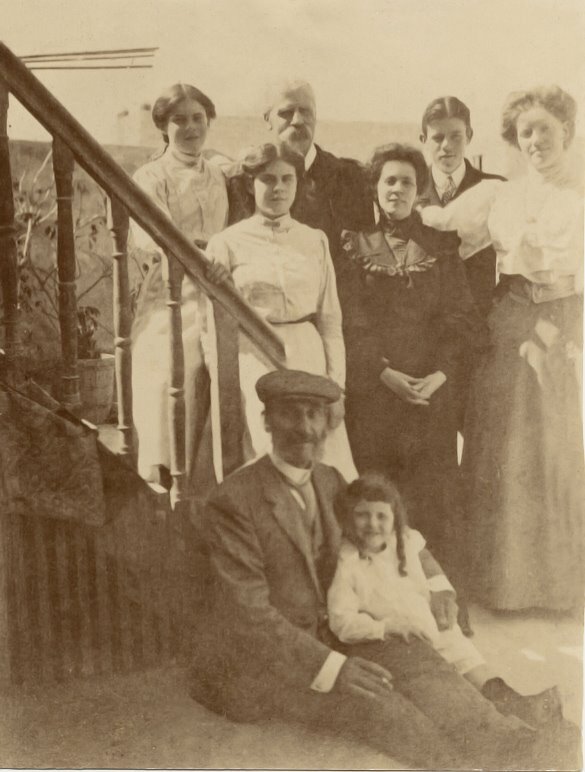 The Letts made many new friends in Bombay and Maria Luisa made a name for herself with her dinner parties. Madras Curry was apparently one of her specialities. The experience of all who knew her in later life, confirms that she was a superb, instinctive cook. 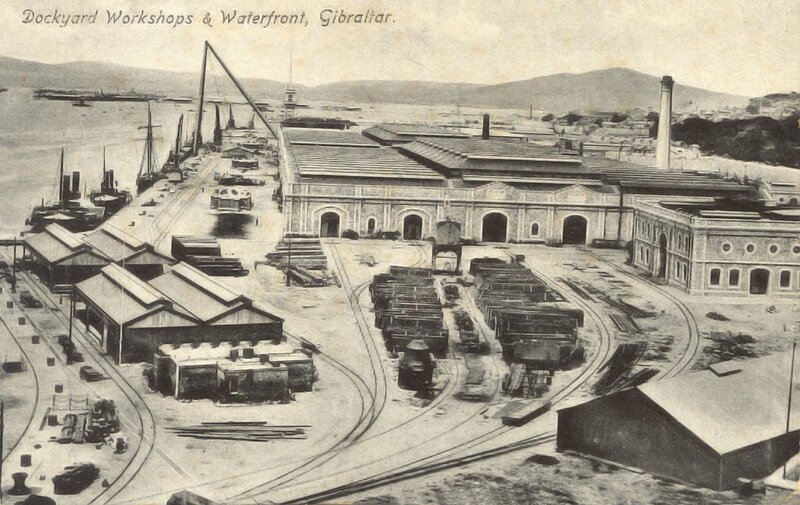 1904 The family kept in touch with their relatives in Gibraltar and the correspondence between Midge Letts and Maria Luisa (2.4) shows that the mail from Gibraltar to Bombay took 13 days. Postcard addressed to my grandfather George Letts (2.3), Eastern Telegraph, Bombay. The text on the side reads ‘Thanks for cigars forgot it in my letter. JL’ which suggests it was probably sent to him by his brother, Joe Letts. It went by sea post on the 8th September 1904 with a 1d stamp. 42 Crutchett’s Ramp appears in the postcard. 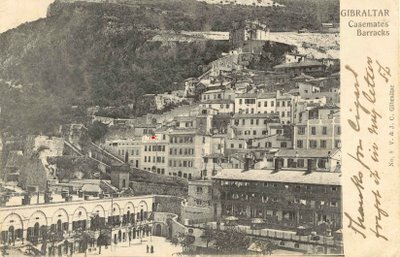 The patio that tops the three floors of the building is marked with a small red square. I can’t quite make out whether the third floor flat had yet been constructed. During their time in India, Maria Luisa (2.4) in the best traditions of the British Raj, employed an Ayah to look after Evelyn. One day the Ayah made Evelyn a present of a lucky charm which was to be worn around her neck. It was only many years later that Evelyn (1.2) tumbled to the fact that the charm was in the form of a stylised phallus and was in fact a fertility symbol. 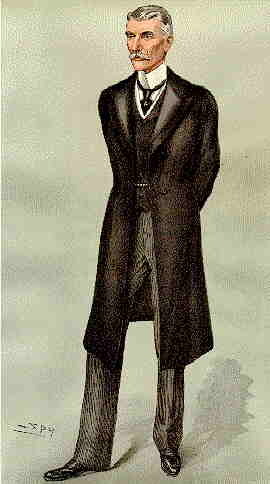 It was while the Letts were in India the Russo-Japanese War began. A friend of Maria Luisa, who was in Japan at the time sent her an interesting and unusual series of postcards. They were anti-Russian Japanese propaganda in cartoon form. Many years later they were thrown away in a misguided fit of spring cleaning. 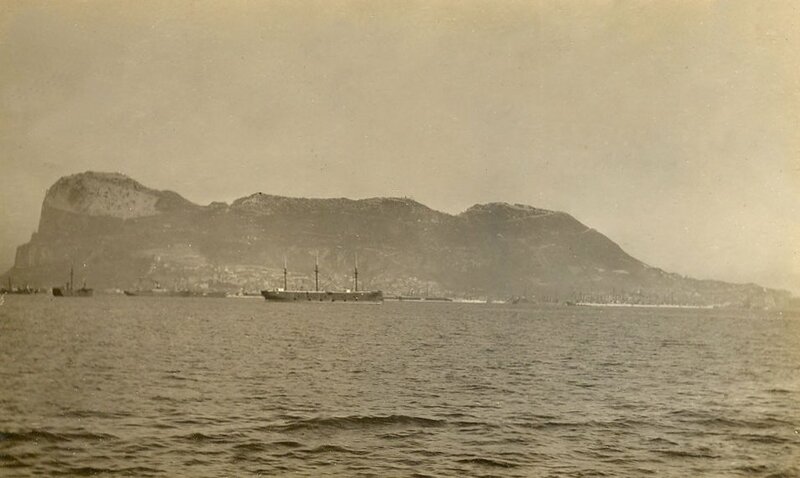 A postcard that did survive was one sent in October to Bombay by Maria Luisa's sister Anita. 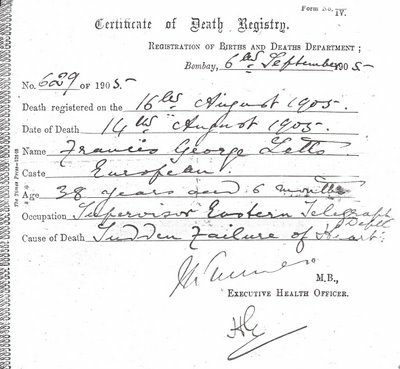 It confirms that the baby Edith was still alive in 1904. 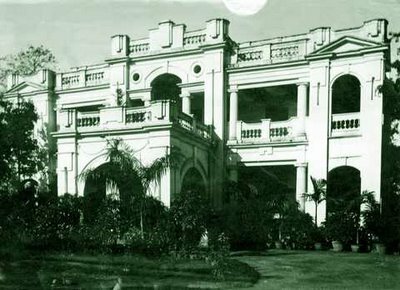 The various photographs of the period make one reflect on the kind life-style led by of the families of the ordinary employees of the Eastern Telegraph Company. I hesitate to think what life must have been like for the top officials. There is no doubt in my mind that Maria Luisa’s years in India must have more than reinforced her rather arrogant personality and her normal tendency to order people around. When she was not much more than 4 years old, my mother Evelyn (1.2) was taken for a walk up the Malabar Hill by her father. 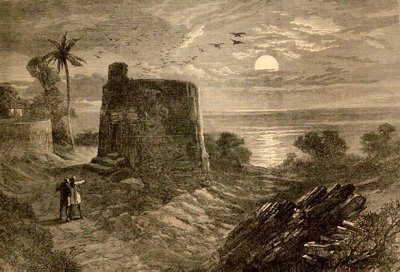 There she saw the sacred 'Towers of Silence', where the Parsee placed the dead for the vultures to pick the bodies clean. The Towers of Silence. Evelyn (1.2) was taken for a walk up the Malabar Hill by her father to see this. 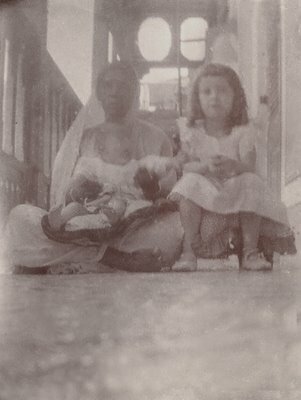 My mother Evelyn Letts (1.2) and friend. Evelyn on the left is four years old and looks as if butter wouldn’t melt in her mouth. Her friend on the other hand looks like a bit of a handful. 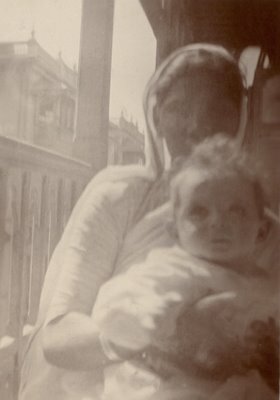 The photograph was taken in Bombay by Vernon who had a studio in the Esplanade Road. That year the Letts family must have returned to Gibraltar on home leave. 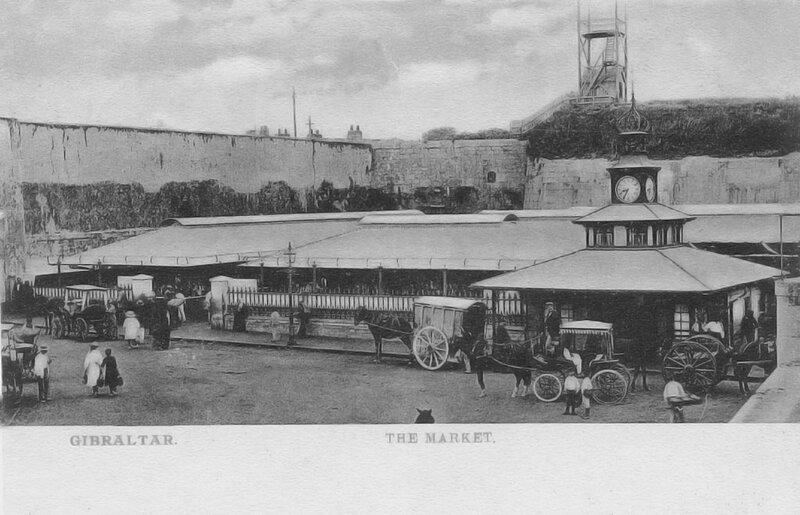 It was either on their journey home or perhaps on their return to India, that their ship visited Malta. While the family were sightseeing on the island, George was struck by a restaurant sign with the name 'Lina' on it. Turning towards his daughter he pointed it out and said, 'You see that sign there with the name 'Lina'? That's what I'm going to call you in future.' And so he did, although not for very long. 1905 On the 14th of August tragedy struck. 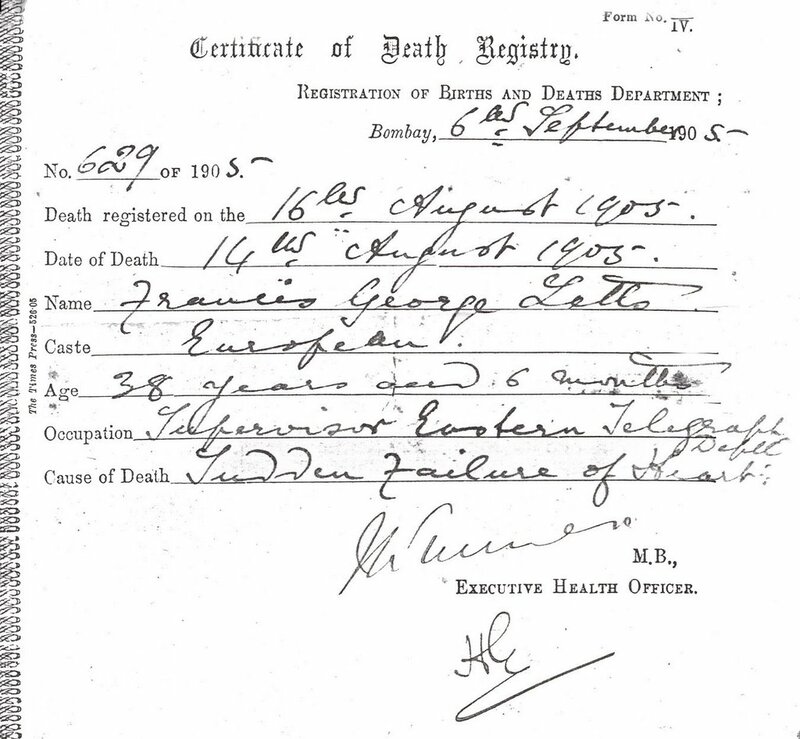 George Letts (2.3) died in Bombay According to the death certificate this was caused by a 'sudden failure of the heart'. He was 38 years old. Lina, then a young girl of five, was old enough to remember the funeral. She was somewhat confused when a lady friend of the family pointed to the imposing hearse, which was drawn by plumed black horses, and whispered: 'That is your father.' Lina thought she meant the black horses. While clearing out his personal effects Maria Luisa (2.4) found among his papers a letter from a colleague from one of the stations he had served in as a bachelor. The colleague had written that someone called Eva was missing him badly. Although no reaction is recorded or remembered it is pretty certain that Maria Luisa was not amused. George only left his wife some 300 pounds. To make matters worse Maria Luisa was not entitled to any widow's pension. 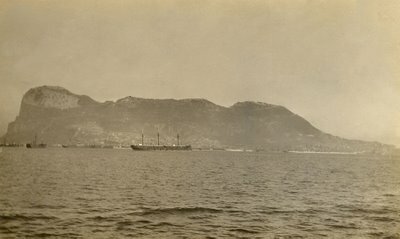 There was nothing much she could do but pack her bags and return to her father's house in Gibraltar. There she found that General, Sir Frederick W.E.F. Forrestier-Walker had recently become governor. His name would soon become well known in rowing circles. Not long after his appointment he donated a challenge cup which was rowed once a year by oarsmen who had yet to win an inter-club regatta. Another Boer War man but better than the previous one. The No. 2 dock was finally opened and Queen Alexandra came visiting on her own. She left 100 pounds for the poor. There were no telephones in those days. Most women in similar circumstances at that time would have stayed at home with their own family, but Maria Luisa was made of sterner stuff. Through the good offices of the local company manager, she was offered a job in Alexandria as housekeeper in bachelors' quarters for Eastern Telegraph Company employees. Perhaps influenced by the fact that she was returning to old haunts and that she would be able to renew her acquaintance with the many friends she had made there, she accepted the job. Another postcard sent by Midge to Alexandria confirms that she was already there by April and that she had taken Lina with her. Another postcard and yet another bleak view. The social event of the year, however, was the marriage of Alfonso XIII to Victoria, a granddaughter of Queen Victoria. 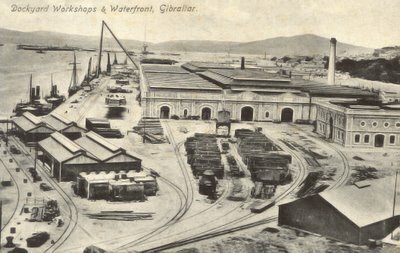 A Spanish King marrying an English princess was bound to have some effect on life in Gibraltar. During the next King's Birthday Parade, Spanish Cavalry took part in the general cavalcade. It seems the Bourbons were keen to maintain reasonably amicable relationship with Britain. Or perhaps Alfonso was just trying to please his wife. 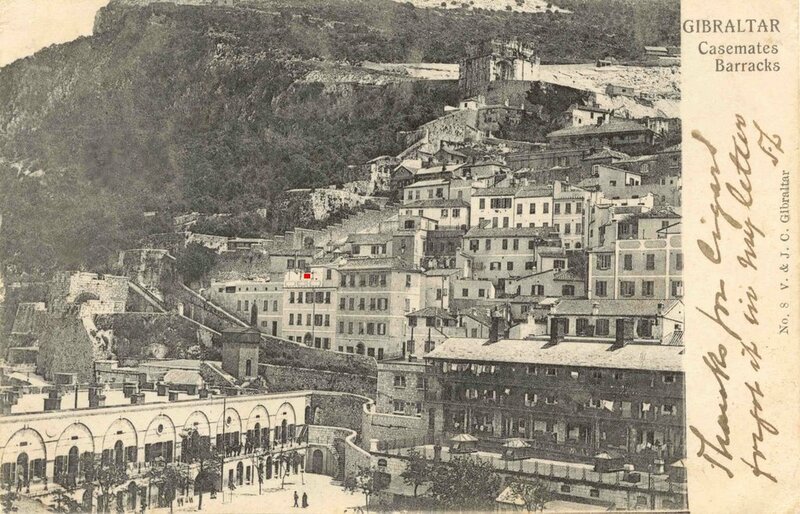 It was probably around this time that my other grandmother Memo Chipulina (2.2) suffered some nervous disorder that required treatment in Málaga. She seems to have been away for quite a while as her husband, Angel, is reputed to have taken a mistress during her absence. Since he was a rather discreet individual, nobody knows very much about the affair, but the woman involved was supposed to have been a beautiful Jewess. Back in Alexandria Maria Luisa’s (2.4) life as a housekeeper cannot have been easy for a woman of her disposition. Almost immediately she seems to have had friction with the local superintendent. When she complained one day that there was a lot of pilfering of small items of linen going on by the native staff, he told her philosophically that in Egypt that was a way of life, and that trying to put a stop to it was more trouble than it was worth. As with the police in Bombay, it was the kind of answer that Maria Luisa found impossible to accept. My grandmother Maria Luisa Letts (2.4) with friends in Alexandria. This photograph was taken in Alexandria when Maria Luisa Letts was working there as a housekeeper after her husband had died. She stands fourth from the left still dressed in black. The little girl is Evelyn (1.2) and the rest may or may not be members of the Archer family who were good family friends. On the back of the photo someone has scribbled: ‘Taken by the side of an old hen coop’. Of the many photographs I have of my grandmother, this is one of the very few in which she has been caught smiling.